We often tend to mistakenly think of the 1980s in ways that paint it as uniformly conforming to certain trends consistently throughout the decade. If you look into the cultural and political history of the 1980s, however, you will see something in the late 1980s I call "Reagan Dusk." During this period criticism of unequal social conditions became more prominent in popular culture, and there was a growing negative reaction to what neoliberalism had wrought. This coincided both with the thawing of the Cold War and the Iran-Contra Scandal, which undermined the Reaganite view of global conflict as well as trust in the Gipper, respectively. The president himself was sundowning, growing senile and more prone to health problems. Public memory of the 1980s has mish-mashed it into a big neon spandex blur, the so-called "Greed Decade" for many progressives, or a golden age overseen by Ronald the Great by conservatives. Both interpretations are wrong. Dissent coincided with greed. Reagan's popularity waxed and waned, and his so-called "revolution" started running into its own limits. 1986 was the crucial transitional year for all of this. That was the year the Iran Contra scandal broke, hampering Reagan's popularity and bringing on talk of a second Watergate. 1986 was also saw a summit in Iceland between Gorbachev and Reagan that heralded a great lessening of tensions between the superpowers. Earlier that year the Chernobyl disaster forced the hand of glasnost in the Soviet Union. In America Reagan signed a massive tax bill that included tax increases on the wealthy from the extremely low levels he had set in 1981 and a tacit admission that supply side economics were not magic beans that could lower the deficit by cutting taxes. (Of course, that idea would soon be back.) All the while, AIDS raged, the horrible toll unacknowledged by the president. In a nation where thousands were dying of disease, there was no "Morning in America." Popular culture, however, took longer to catch up. The ultimate expression of Reagan-era ideology on film, Top Gun, was the highest-grossing film of the year. The same year also saw Cobra, Sylvester Stallone's bluntest 80s statement on violence as will to power. (His catchphrase, "you're the disease, I'm the cure" sounds chilling post Trump.) Popular music was as big as the shoulder pads and hair so common at the time and as loud as the patterns on the shorts and dresses of Americans that summer. At the fringes, however, the Reagan Dusk was just barely visible. It could be heard on Life's Rich Pageant, the fourth album from REM, the rock band poised to bring the sound of the underground to the mainstream. REM's first three albums are masterpieces of jangly guitar and mysteriously mumbled lyrics with an overlay of Southern Gothic on top. Your average indie rock fan today still pays homage to them. They are less likely to do so for Life's Rich Pageant, where the band took a turn that in retrospect ought to be lauded rather than disdained. The change is obvious immediately, as "Begin the Begin" starts with a hard-edged rock riff and loud feedback beneath Stipe's voice, which is suddenly much clearer, the lyrics more legible and now, for the first time, topical. The loud snare drum reflects the times and the production of Don Gehman, who had worked on heartland rocker John Cougar Mellencamp's albums. This song is a call to arms amidst the wreckage of the Reagan Era, but the lyrics are cryptic enough not to make it a traditional "protest song." There is dark talk of "The powers/ the only vote that matters" but a cautiously optimistic cry "let's begin again" as well. Before the listener can catch their breath, the song transitions immediately without pause into "These Days," with a fast, loud, blistering riff by Buck over muscular Berry drums. (This is the album where Bill Berry's beginnings as a metal-head are most evident.) It might be the only REM song that encourages head banging. The words are fiery too, "We are old despite the times" and "I'll rearrange your scales." The one-two punch of "Begin the Begin" and "These Days" is an announcement that REM has abandoned its Southern Gothic Folk Mystery thing and is grabbing for the crown of Band That Matters. These days, when Bono has become kind of a joke and social media has made political activism more accessible, the significance of this move has been diluted. In the middle of the Reagan Era, when nuclear war threatened, cities rotted, and AIDS ravaged the country while the media and political figures barely seemed to care, music stepped into the breach. For someone like me, who grew up in a very rural, conservative area, it was not just a lifeline, it paved a way for my embrace of a more progressive politics. Hip hop (and especially Public Enemy) provided me with the most radical musical critiques, but REM was important too. After all, they hailed from Athens, Georgia, and were a sign that resistance to the dominant politics of the time could exist in places like the one where I lived. The political themes continue on the first side of the album, but songs ease back into folkier territory, such as in the ringing, beautiful "Fall On Me." "Buy the sky/ And sell the sky/ And lift your arms up to the sky/ And ask the sky and ask the sky/ Don't fall on me." I remember Stipe saying it was about acid rain, but for obvious reasons it calls to mind other environmental dangers we face today. The beautiful Mike Mills background harmonies truly make this song, though. While REM might be headed in traditionally more "rawk" directions here, they are doing it their way with their own unique sound. "Cuyahoga" continues discussion of the environment, referencing the Cleveland river that was once so polluted that it caught fire. It also discusses Native American history, and how this nation's wealth was built on the theft of others' land. Such critical re-evaluations of American history would be more commonplace during the Reagan Dusk, leading to the inevitable anti-PC backlash of the early 1990s. The sound is folkier than the album's start, but the lyrical message is unmistakable. After those first four songs, the political elements are more subdued once the band has laid down the gauntlet. With different, less big production, "Hyena" could belong on Reckoning. Of course, lines like "The greater the weapon, the bigger the fear" seem to reference geopolitics just a little. The jaunty Latin dance-y song "Underneath The Bunker" with Stipe's unintelligibly filtered voice might be a nuclear war reference, but that's easy to ignore. It closes out side one, cheekily called the "Dinner Side." Side two, the "Supper Side," goes into more explicitly political territory with "The Flowers of Guatemala." (On CD the transition from "Underneath the Bunker" to this more serious song is quite jarring.) The song references, of course, America's support for brutal military regimes in Guatemala, but does so in a mournful rather than rage-filled way. Stipe sings mournfully of the flowers on the graves of those murdered by the state. It is one of the most moving and powerful songs in REM's canon, and highlights issue that most people in this country, even those who are political progressives, choose to ignore. Amid the justified anger over Russian meddling in American elections, folks in America might want to take a minute and ponder what their own country has done elsewhere. It's hard to top a side-opener like that, and REM really doesn't. A trio of solid but less evocative songs follows: "I Believe," "What If We Give It Away," and "Just A Touch." The latter is my favorite for its up-tempo punkiness and the story behind it. Evidently as a teenager Stipe witnessed an Elvis impersonator being mobbed on the day of the King's death by a group of distraught female Elvis fans, one of them saying "C'mon love, just a touch." The whole thing is just a fun rave-up and an unlikely segue into "Swan Swan H."
This acoustic song puts us back into REM's Southern Gothic mode big time. The lyrics reference the Civil War, Reconstruction, and Emancipation ("Hurrah we're all free now.") For such a politically important time in America's history, there does not seem to be much politics here, more setting a mood. That said, it's catchy as hell and in my youth I would listen to it over and over again. The album ends on an unlikely note, with a cover of an obscure 1960s song, "Superman" by The Clique. It puts on full display the band's love of psychedelic garage rock (which is all over the rest of the album), but also mirrors another aspect of the coming Reagan Dusk: 60s nostalgia. One could argue it was kicked off in 1986 when MTV ran a bunch of Monkees episodes one weekend. Nostalgia for that decade, of course, was a kind of a political statement in itself in the midst of the conservative backlash. 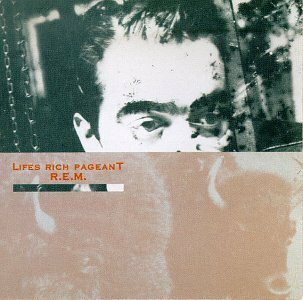 Life's Rich Pageant is a classic "tweener" album. REM abandoned the formula that the Pitchfork crowd still idolizes, but its new, rock oriented sound did not yet yield any hits. That would soon come with 1987's Document, once the Reagan Dusk had truly started to fall. Life's Rich Pageant is a document of the other 1980s, the 80s of dissent and protest and resistance, of ACT-UP and anti-Apartheid. In our own fraught times when we need to begin again, it is well worth another listen. I was not anticipating a huge turnout, mostly because people around here tend to go to marches like this in New York City to be a part of the bigger, more noteworthy event. I was happily surprised to see a very large crowd at Military Park in downtown Newark when I arrived, and by the time things got kicked off, it doubled in size. The event started with a half hour of speeches and performances, then we marched over to Washington Park and snaked around it to go back to Military Park to hear speeches by the big shots in attendance. I knew we were a big congregation because I was near the front, and once we got around Washington Park we had to stop because the people in the back third were blocking our way because they were still coming. One thing I was very glad to see that while this event drew a lot of people from suburban New Jersey, it still put a lot of focus on Newark. Students from Newark schools performed music and dance, and they gave speeches that talked about gun violence more broadly. They spoke not just about school shootings, but also of the day to day gun violence in the streets of Newark, domestic violence, and police shootings like the recent tragedy in Sacramento. I came away from the event thinking that many of the white, suburban attendees might also see the issue of gun violence with a broader lens. That's necessary, and also an important rebuttal to naysayers who refuse to participate in this movement because they think it doesn't check all of their woke checkboxes. While the students may have stumbled a little over their speeches or not have been completely polished, those things only served to highlight their courage. I did speech and debate in high school, but I could not have imagined giving a speech in front of thousands of people with the governor and my Congressman sitting in the wings. The politicians in attendance did a good job motivating the crowd and keeping things brief, at least. My representative in the House, Donald Payne Jr, has actually been out front on this issue and has crafted a bill for gun buybacks. He kept things fiery, and connected the march with the need to vote in the upcoming election. (A lot of the people there hail from purple districts currently represented by Republicans.) New governor Phil Murphy gave a very short, to the point speech emphasizing efforts on the state level. I even cut state senator (and charter school supporter) Teresa Ruiz some slack because her comments were pretty effective. This event gave me hope because the main reason gun control has failed to be passed at the national level has less to do with the NRA itself and more to do with the extreme pro-gun minority. These people have always cared a LOT more about guns than the people who wanted to limit them. Guns for them are closely tied to their deepest identities, and so like Prohibition gun control is really an argument over what kind of country this is. Opponents of gun control have been acting desperate and attacking teenage survivors of mass shootings because they know they have been in the minority for years and have been getting by on complacency. Will this actually lead to meaningful change? I do not know, but I get the feeling that outside of deep red areas politicians who are highly rated by the NRA are going to be forced to answer for that. On an unrelated sidenote, I briefly talked yesterday with Essex County Executive Joseph DiVincenzo yesterday, but only realized it after he walked away. "Joe D" is one of the big political fixers in the state, with rumors of corruption swirling about him. Despite that, Chris Christie never prosecuted him during his stint as state's attorney, when he went after several corrupt politicians. Joe D paid him back by supporting Christie's re-election, despite the fact that he was a conservative Republican and DiVincenzo is a Democrat in a a county that is deep blue.Yesterday, as we were stopped on the march route, a distinguished gentleman struck up a conversation with me, and his face looked strangely familiar. I made a little friendly small talk, and when the march ended he squeezed my arm and thanked me for showing up. At that moment I realized it was indeed Joe D, but it was too late. I was going to ask him why if he cared about gun control so much he supported a governor who vetoed new gun legislation. My hope is that Democrats like Joe D saw what was happening yesterday and got a little scared for themselves. Machines like his rely on political complacency, a complacency which has made it possible for a blue state like New Jersey has been living under austerity for the past eight years. Even if gun control does not get passed in the short term, we are perhaps seeing a political awakening from the left that will not only get Republicans tossed out of office. Just as importantly, it could also give us better Democrats. One can only hope. Hey folks, I've got a new piece over at Tropics of Meta, "The Ground Zero Mosque Was A Harbinger Of Our Times." It was inspired by an off-hand comment by Tropics editor Alex Sayf Cummings about that particular event. I happened to be present at the protest against the Cordoba House (which was not within site of the WTC, by the way) by accident. The hate-filled mob I witnessed on a summer day in 2010 scared me. Back then they were called the Tea Party, now we call them "Trump supporters." Read the piece, and tell me what you think. Well, I've managed to get the podcast back on track again. Episode 25 is all about country music, which has been a comfort to me in recent days. I look specifically at how 70s artists embraced other genres in interesting ways. In this case I talk Waylon Jennings, Buck Owens, and Terry Allen. We tend to think that the Cold War ended in 1989, with the fall of the Berlin Wall, or in 1991, with the dissolution of the Soviet Union. I tend to think nowadays that it finally ended with the ascension of Donald Trump to the presidency. The Cold War was, in many respects, a conflict destined to destroy both of its participants. It just so happens that the Soviets lost the war of attrition first. Their stagnant economy could not sustain its military and imperialist commitments as belief in communism eroded. While America claimed to emerge victorious, its society was already crumbling into steep inequality and cynicism in the 1980s. Those trends have only continued to the point of absurdity to the present day. The Cold War demanded a massive level of spending and multiple wars. As America's military might increased, the standard of living for its people took a dive. America may have "won" the Cold War, but people are drinking poison in Flint, and parts of cities across this country still look like they've been bombed. Much like Britain after the two World Wars, victory does not save the empire. Meanwhile, in the international arena, America tried to extend the life and reach of Cold War institutions, rather than replacing them. Hence NATO moving into Eastern Europe, for example. The post-1989 presidents still maintained America's commitment to a global projection of power, changing the enemy from communism to Islamism after the 9/11 attack. As awful as the United States behaved during the Cold War, it at least had a somewhat idealistic self-conception of its behavior. Trump has set about shredding the institutional webs of the Cold War world, not out of ideals, but out of craven nationalism. Beyond that, of course, he was supported in his quest for power by Vladimir Putin. The ex-KGB agent got the last laugh, avenging the end of the Soviet Union by helping to install a destructive idiot at the head of America. Obama tried to repair the damage done by Shrub to America's standing in the world, Trump has torn that work to shreds. Now that damage will be permanent. I don't think there's any going back from this. In 2018, that aforementioned idiot is driving the nation into the ditch. Despite this accomplishment, Putin's Russia is still economically weak and irrelevant. The USA and USSR both managed to bury each other, making way for an ascendant China. The Cold War is finally over, and both sides lost. 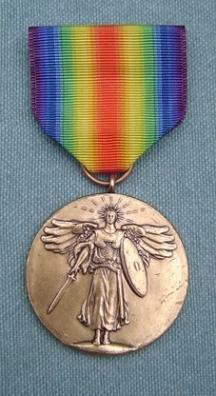 A medal for "The Great War for Civilisation"
I have been thinking a lot about World War I recently. It's the historical event that I probably have the most sustained interest in. It is so immense in scope and importance that I am always finding a new wrinkle or side to do a deep dive into. I am usually most preoccupied with thinking about that event as a moment of breakage and turning. Most historical changes come slowly, but the Great War was a cataclysm that smashed old empires, spurred revolutions, and redrew the map of Europe. There has yet to be an event quite like that in my lifetime, even the fall of the Berlin Wall and 9/11. I've been thinking especially about what the war meant to those who participated in it. Despite having read about it for years, I only recently (while reading Dos Passos USA trilogy) realized that the full name used at the time in Britain and the United States was "The Great War For Civilization." Civilization was, of course, an incredibly loaded concept in the English-speaking world in the early 20th century. It tended to be invoked to justify imperialism and colonization, treating the violent subjugation of other people against their will as a benevolent act. While the war was viewed as a monstrous waste of human life and devoid of meaning in famous works by Sassoon and Remarque, that point of view was not shared by millions in the Allied nations who felt that they had helped make the world a better place. The positive view of that conflict has all but perished. There's a reason that the Wonder Woman movie was set in the first world war rather than the second: if she is opposed to war itself, few wars are as unsympathetic as the Great War. I guess this has me thinking that we can interpret earth-shattering events in real time in ways that will seem alien or silly with the passage of time. After World War I there really was a sense that a better, less violent world was going to be brought into being. The Great Depression, of course, helped shatter that feeling. I feel similarly when it comes to the collapse of the USSR. Even though the Cold War had, like the Great War, involved a great deal of government deception and needless slaughter (Vietnam, Pinochet, etc.) there was a general consensus in 1991 America that it was "worth it." There was also a general notion that "tyranny" had been defeated, and that the postwar order would be one of peace and democracy. There was indeed a general increase in democratic nations around the world, but the genocides in Rwanda and Bosnia were a clear sign that nationalism had not been tamed in the New World Order. In recent years the nationalist wave has been cresting, and the post-Cold War order (which was more an attempt to extend the life of the post-WWII order in the West and project it around the world) has been shaken to its core. Populist nationalism with an authoritarian streak dominates Poland and Hungary, two countries whose fledgling democracies had also failed to survive the post-World War I wave of nationalism. In Britain Brexit, in India the BJP, in China Xi an authoritarian populist for life, in American, Trump. The latter's shredding of trade agreements and attacks on NATO might well be part of a tectonic shift in world politics. Nowadays the notion that the Cold War was somehow a great victory against tyranny ensuring a long-standing peaceful world order should be starting to sound as ridiculous as people saying that kind of thing about World War I. I think the events of 1989 have made a lot of us (myself included) complacent about the fragility of democratic forms of government. We are like the sturdy middle class Brits who thought that the sacrifice on the Somme somehow meant a blow for civilization. Now I look about, and think of Sir Edward Grey's famous comment after Britain opted for war: "The lamps are going out all across Europe, we will not see them lit again in our lifetime." At the suggestion of my friend Chauncey DeVega, I am sharing some songs that have been important for coping with the current Trumpian nightmare. These songs are spread across multiple playlists I've made, here I decided to make a playlist with playlists inside of it. Enjoy, and feel free to add your own. Some nights under Trump I sit in front of my computer, speechless and sad, unable to believe this is all actually happening. I call this "the late night dread." Here are songs I listen to in those moments. This alt-country band likes to keep it dark, and no song has spoken to me in recent months like this one. Dread personified. It was written as a response to the Bush years, but now things have returned to that state, but worse. Key line: "I don't want to live in America no more." A song about ghosts and questioning reality. The feeling that nothing makes sense is a big part of the late night dread. Not a political song, but the feeling of midnight doom is pretty thick on this one. One of the all-time great early 70s dark soul songs, about the feeling that snakes are everywhere and honest people are hard to find. The song definitely resonated with Watergate, when it came out, and with our own current Watergate echo. Sometimes I need to have my emotions really shaken up to the point of tears. I have found it cathartic, a way to get all the negative feelings out of my system so I can conquer The Fear and be ready to get back out and fight again. These songs help bring the tears. "Working for the church while your family dies/ Singing hallelujah with fear in your heart." The song I listened to as my commuter train entered the tunnel the day after the election and I lost it. A song of a father sung to his infant child about how this world is a vail of tears. Gets my every time. Classical music hits emotional places for me that other music can't reach. This song, written in the dread on the eve of World War II, seems to scream the undying scream of the universe. In the midst of a symphony meant to appease Stalin after being threatened with being sent to the gulags, Shostakovich wrote this dirge as a way to mourn his friends who had been cut down by the Terror. Other times I feel less like crying, and more just staring out at the greed and awfulness and absurdity of our current situation. Some songs help with that, too. The song's narrator is a callow rich kid abroad who gets caught up far too deep in international intrigue, and is calling his dad for help. Always reminds me of Jared Kushner. Newman is famous for writing songs from the perspective of reprehensible people, in order to satirize the stupidity of their outlook. This song, about nuking the world, is a parody of dumb American nationalism that sounds frighteningly like Trump. The filthy, throbbing crotch of our current administration is greed most foul. This is perhaps the best anti-greed song every written, and a helluva tune. I like this cover of the Tears for Fears song, which has a more melancholic tone than the original. The corrosion of greed we were warned about in the 80s has met its full flowering. Other times I need to be ready to fight. When it's time to get my protesting shoes on, there are certain songs that I turn to. I blasted this one during a "drive by" protest at Trump's Bedminster, New Jersey, course. I blasted this one going back the other way for good measure. Great message, great marching beat. I listened to this one on the way to the Bedminster protest. This song was originally meant to be kind of a parody of hippies, but in this incarnation I take it as a call for all of us to come to our collective senses. Sometimes after listening to the late night dread songs I'll throw this one on and pump my fist. These Detroit proto-punkers laid down many scorching tracks, but this is one I put over my headphones when it's time to get out there and fight. After a bit of a hiatus the Old Dad's Records podcast is back for episode 24. This time around I went with music that hits me right in the feels. The song this week is The Verve's "Bittersweet Symphony," which I blogged about awhile back. After that I delve into a Carpenters compilation record. Their music more than any other transports me back to my early childhood. I also tend to listen to it in times like now when my spirit is feeling a little tired. I end the episode by raving about the band Hooray for the Riff Raff, which have a unique and engaging sound. Recording the podcast made me realize how my mental state has probably not been too great recently. This time of year usually makes me miserable, but the fact that I had been deriving less pleasure from music and talking about it was a sign of a deeper issue. Hopefully you all are weathering the doldrums of late winter well. In the weeks since the Parkland shooting, the president of the United States has endorsed arming teachers. Others have proposed turning our schools into armed camps. School children are doing even more "Code Red" drills. However, the biggest modern mass shooting in America took place at a concert. Many others have happened at restaurants or churches, yet we do not see a call to require armed pastors or to turn every Applebee's into a fortress. The reason for this is pretty simple: the people who want gun proliferation hate public schools. They want to make public schools miserable places because public schools go against their ideology, which claims only the private sphere is good and matters.They want a society where everything public is gutted and personal violence is the ultimate law. In this dystopic understanding we should all have guns, and then ultimate peace will prevail. Gun control matters because it is a fight against a pernicious worldview. Fighting for gun control isn't just about saving lives, it is about combatting an absolutely sociopathic understanding of society, one that I think is related to this country's wealth inequality, killer cops, rotting infrastructure, underfunded schools, lack of social safety net, and general crappiness for those not fortunate enough to be rich. If we are to have a more social democratic society, more people in this country need to have a more social democratic outlook. Those opposed to it have used guns very effectively. They sell a seductive narrative of individualism, one where the government is an impediment and armed citizens should be empowered. As with health care, however, guns are an issue where social democrats can easily point out how our lives can be made so much better with a collective solution. After decades of neoliberalism, it is time for a social democratic moment, and social democrats can seize it on issues like guns, which do not first appear to be of a traditionally social democratic nature.